A Catering Invoice Template is a document used to charge for the providing of food service for parties, special events, weddings, business meetings, or any situation in which food is not readily accessible. In addition to providing food, Full-service catering can include servers that tend to tables, cutlery, custom menus, set-up, and post-event cleanup. Below is a sample of the types of activities that catering is hired for, as well as the catering invoice available for download in four (4) formats, including PDF, Word, RTF, and Excel. What can you charge with the Invoice? The Catering Invoice can also be used as a quote – giving clients a chance to see the expected costs beforehand. Doing this ensures both parties are on the same page and typically improves the relationship between client and provider. To download an invoice made specifically for quoting, check out the Proforma Invoice. Download the Catering Invoice in Adobe PDF or Microsoft Word. Enter the name of the salesperson responsible for arranging and providing the catering services, the delivery date (or when the event will be held), the terms of the invoice; ex: “Net 30,” and the date the full invoice will be due by. In the table, enter the number of times each service was ordered, a short description of each, the cost of one (1) service, and the total for each (number of services X cost of each service). Enter the total in the “Amount” column. Add up all amounts and enter the result into the “Subtotal” field. 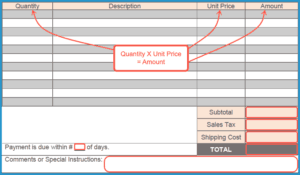 Then, enter any sales tax (if applicable), food shipping / transportation costs, and add them both to the subtotal, entering the result into the “TOTAL” field. Finally, enter the number of days the client has to pay the full invoice amount followed by any comments / instructions the caterer has for the client.